Here are solutions for several common mistakes made in laboratory lyophilization. Following these suggestions can increase the quality of your samples and prolong the life of your freeze dryer. Often a sample is placed on a freeze dryer without any consideration as to the compatibility of the sample with the specifications of the freeze dryer. When lyophilizing, it is important to identify the components of the sample and their requirements for lyophilization. Incompatibility can result in decreased quality of the freeze dried sample and, more importantly, expensive damage to the freeze dryer or vacuum pump. Although it is not critical to know the precise freezing point of a sample, estimating the general freezing point or eutectic temperature of your sample is important. The collector temperature of the freeze dryer is recommended to be 15° C to 20° C below the freezing point of a sample. This difference is necessary to keep the sample frozen during primary drying and to effectively trap the lyophilized vapors before they reach the vacuum pump. Collectors have fixed temperatures at -50° C, -84° C and -105° C. For aqueous samples, a -50° C collector temperature is adequate. When solvents are present in samples, the freezing point is suppressed. For samples containing acetonitrile, a -84° C collector is recommended and for samples with up to 10% methanol, a -105° C collector is recommended. No harm is caused by using a freeze dryer with a collector that is colder than the minimum requirement. It is important to ensure the size of the collector is big enough to accommodate the volume of the entire sample load. Stopping a run and defrosting the collector is not an ideal option. It is easier to make sure your entire run can be accommodated before starting the run. No harm is caused by using a collector that is bigger than the minimum size requirement. Some samples may contain compounds that require special components in the freeze dry system. Acids, solvents and particulates are common compounds that can be accommodated with modifications. Acids: Polytetrafluroethylene (PTFE) coatings protect stainless steel collectors and coils. Solvents: Glass lids are used when a solvent damages acrylic lids. Particulates: Inline HEPA filters, placed between the collector and the vacuum pump, protect vacuum pumps from damage from particulates. 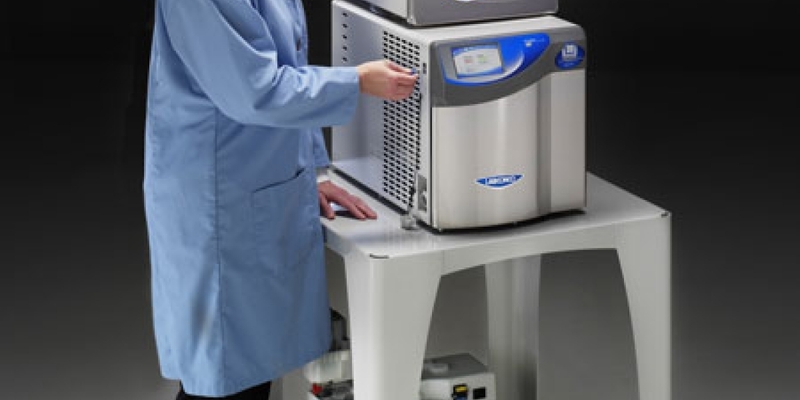 Maintaining deep vacuum levels is the most common problem in laboratory freeze drying. A damaged vacuum pump is the leading cause of inadequate vacuum levels in a freeze dry system. If the vapors are not completely collected on the coils in the collector, they will enter the vacuum pump. Oil vacuum pumps are the most susceptible to damage from these vapors. Often the vapors will condense in the pump and mix with the oil. Once mixed in the oil, water can cause extensive damage to a pump while solvents and acids can cause even more damage. Combination rotary vane/diaphragm and scroll pumps are more resistant to harmful vapors but still can be damaged from exposure. Damage to any pump will be avoided by preventing vapors from entering the pump. Ensuring the compatibility of the samples to the freeze dryer, as discussed earlier, is the most important preventative step to vapors entering the pump. Here are more suggestions. To prevent vapors from entering the pump, make sure the collector coils have cooled to at least -40° C before the vacuum pump is started. If the collector coils are not at adequate temperatures, they will not trap moisture from the air and any volatile vapors during system pull down. Having a purge valve that allows the vacuum pump oil to heat up before system pull down will prevent vapors from condensing in the hot oil. The majority of vacuum pumps have a gas ballast that can be used to purge containments from pump oil. After the freeze dry run, a pump should be allowed to operate with the gas ballast open for 20-30 minutes. This gives any vapors that condensed in the pump an opening in which to leave the pump. Running the pump heats the oil so that the contaminants are essentially distilled out of the oil. Frequent oil changes will limit the damage to the pump if vapors enter the pump. During oil changes, flushing fluid can be used to rinse away any contaminates within the vacuum pump. It is important that oil levels are maintained and pumps are never allowed to run above or below the recommended oil levels. Freeze dryers are often laboratory workhorses that are simply used for years with little attention to their maintenance needs (aside from vacuum pump oil changes) until one day they no longer work. With very little effort, the lifespan of a freeze dryer can be greatly increased. At the end of a run, it is very easy to take the finished lyophilized sample and forget about defrosting and emptying the ice in the collector. Limiting the exposure of water or even worse, acids and solvents, to the freeze dryer will lengthen its lifespan. Freeze dry collectors should be defrosted, drained and wiped down immediately after every use. Neutralizing collector coils after any acid exposure is critical. If the collector is not drained, and the liquid is not noticed before the next start up, collector liquid will be pulled into the vacuum pump. Some freeze dryers feature drain line detectors to prevent this maintenance nightmare from occurring. With extended exposure to some solvents, like acetonitrile, over time, acrylic can craze. Lid crazing can compromise vacuum levels and if allowed to continue, may cause the lid to implode when exposed to deep vacuums. Replacing the lid with visible crazing or using a glass lid when lyophilizing incompatible solvents will eliminate freeze dryer downtime. These common mistakes are often eliminated in newer freeze dryers as their designs offer many features that make freeze drying and freeze dryer maintenance easier. Features such as remote notification of operating and maintenance alerts, one-button data logging, auto start-up and onboard diagnostics are just a few of the features available for labs that want a lyophilizer that will provide high quality results, with little hassles, that will last for decades.